I wrote this about 3 years ago now, but thought I would share it as it gives some insight into the seeds of thought that have now grown and purpetuated to become all consuming. My world and my work explores the natural engagment and nourishment children recieve when they spend time in wild natural spaces. This is an avenue I'm sure will reoccur often in my posts as it facinates and delights me :) So here it is! 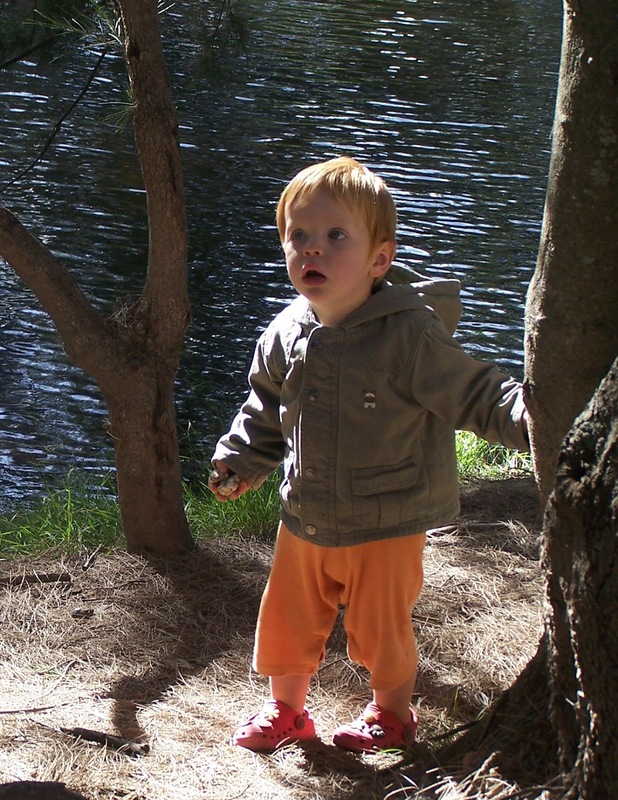 Recently, our family of three went camping for two nights in the Australian bush, next to a river at a place called Wee Jasper (near Australia’s capital, Canberra). Another family joined us with their 2 children (aged 2 and 4) and dog. We took a few toys along for our twenty-month-old, Orlando, but mainly offered him a bucket and spade (his favourite play things). We also had a few cars, books etc… just in case! I have been feeling concerned that Orlando’s physical risk taking was not keeping pace with the rest of his development that he seems to be a bit of a ‘scaredy cat’. Well, as soon as we arrived at the river, Orlando was off playing with the children he already knew well. I was fascinated as I watched him over the three days, exploring the natural environment. Suddenly, I saw my child through different eyes. My ‘scaredy cat’ climber was carefully negotiating his way over complex hurdles - riverbanks full of interconnecting roots, stones and loose leaves. He was wandering off over mounds to climb in and under logs, and squeeze between trees to find the most precious leaf, feather or stone. He tiptoed through slippery mud and cold stones to find the pebble that had caught his eye. He negotiated all of this with only a single slip, in which he caught himself, paused and tried to get himself back up (with dad coming to the rescue when all his other strategies failed). 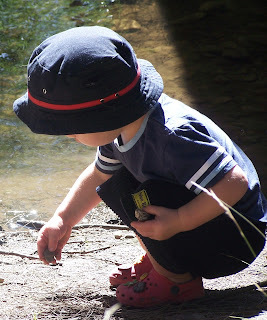 He played for HOURS finding stones and pebbles - 'egg-rocks', 'car-rocks', ‘cold- rocks', 'boat-rocks' - a plethora or rocks for him to choose from and he valued each one. He used them to experiment with water - the ripples and sound created when he threw them in; how the colour changed when the rocks got wet; what sound they made when you banged them together. He lined them up in a row and counted (1, 2, 1, 2, 6, 7, 9! ); stacked them on top of each other like blocks; and selected a few to treasure, holding them in his hand or stashing them in his pocket. The three children conversed over the rocks, working together to cart “big and heavy” rocks from one workspace to another. The 4-year-old who was taking natural leadership and informed her workers that they were building a wall. She also discussed distance with them while throwing the rocks in the water: “Wow, that was far! That one went a LONG way !! That one was only short." By contrast, when the children found my stash of store-bought toys, the nature of the play changed. They sat inside the tent reading the books and playing with the cars and animals. Not a bad thing, but such a contrast. Suddenly, two of them emerged from the tent in tears, as the third child had hit them while fighting over a book. Then, an adult found them with a knife, trying to cut one of the books. Up until this point, no behaviour had needed managing, but now adult intervention was required. Then, fights started over the cars. Although there were plenty for all, this still wasn’t enough. Yet, there had not been a single fight over the rocks and pebbles. So, I quickly confiscated the toys and hid them in the car. For about 30 minutes, the children were lost, bored, didn’t know what to do, as their entertainment had been taken away. “They’re bored!” my friends told me, as they set up a portable DVD player in their car so the children could be ‘entertained’ by a movie. Orlando was invited to join them to enjoy this “treat”. My heart sank. They had been completely entertained previously, while they were engaging in meaningful teamwork and exploration. Now they were watching a movie inside a car with the engine running, while surrounded by a wondrous bush setting. I took a few deep breaths and lured Orlando away. I took him back down to the riverside to share a snack and started to talk to him about the pebbles. Within a few moments, his interest was hooked and he was re-engaged. We made boats to float down the stream, splashed about and continued to explore the beautiful space. 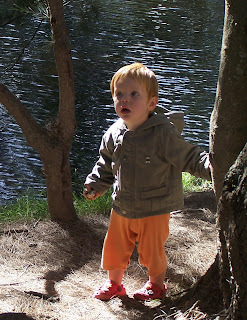 I had gone away camping with vague thoughts about the playgroup I am setting up this year for parents with 0-3 year olds. Having previously established a Creative Play Group, with a strong emphasis on Visual Arts, this was at the back of my mind for this new venture. But now the way forward was clear. Our three-day camping experience had taken me back to my own childhood and its special memories. 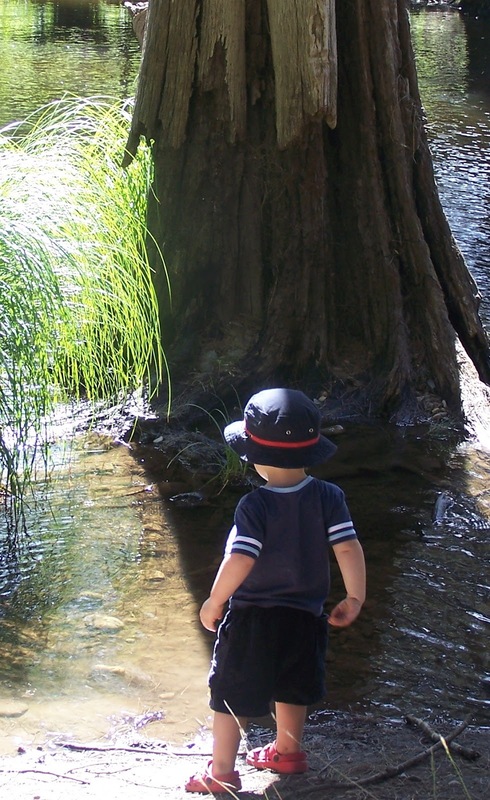 I want our child to re-capture the essence of natural play and the way it inspires children to step out of being ‘scaredy cats’ and to find their own place and their own pace. These commodities need nurturing more than ever in a busy modern world. Nature Play Group, here we come!